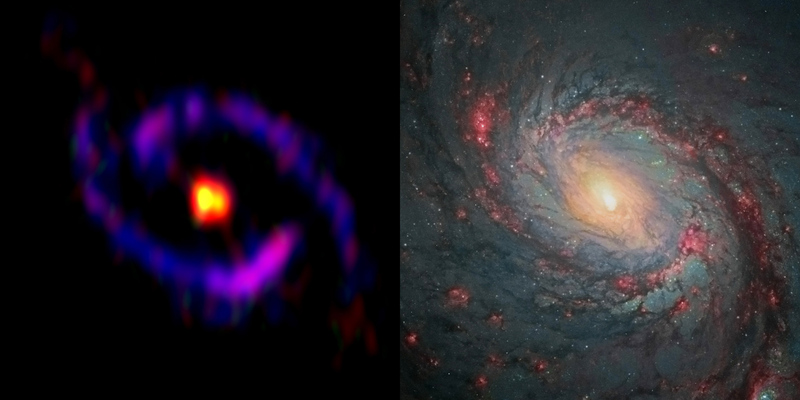 Researchers using the Atacama Large Millimeter/submillimeter Array (ALMA) have discovered regions where certain organic molecules somehow endure the intense radiation near the supermassive black hole at the center of galaxy NGC 1068, also known to amateur stargazers as M77. Such complex carbon-based molecules are thought to be easily obliterated by the strong X-rays and ultraviolet (UV) photons that permeate the environment surrounding supermassive black holes. The new ALMA data indicate, however, that pockets of calm exist even in this tumultuous region, most likely due to dense areas of dust and gas that shield molecules from otherwise lethal radiation. To better understand the complex and energetic environments around a supermassive black hole, the research team, led by Shuro Takano at the National Astronomical Observatory of Japan (NAOJ) and Taku Nakajima at Nagoya University, observed the spiral galaxy M77, which is located about 47 million light-years from Earth in the direction of the constellation Cetus the Whale. This galaxy is known to have an actively feeding central black hole, which indicates it has a substantial circumnuclear disk. That disk, in turn, is surrounded by a 3,500 light-year wide starburst ring. 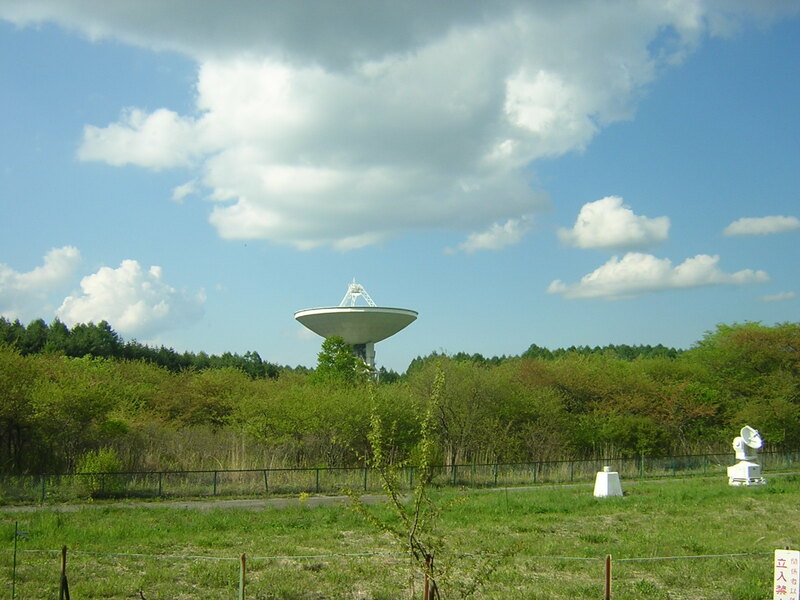 To probe these areas, the research team added ALMA’s extreme sensitivity and high-fidelity imaging capabilities to earlier observations conducted by the 45-meter radio telescope at the National Astronomical Observatory of Japan. The new ALMA observations clearly reveal the distributions of nine types of molecules in the surrounding disk and starburst ring. 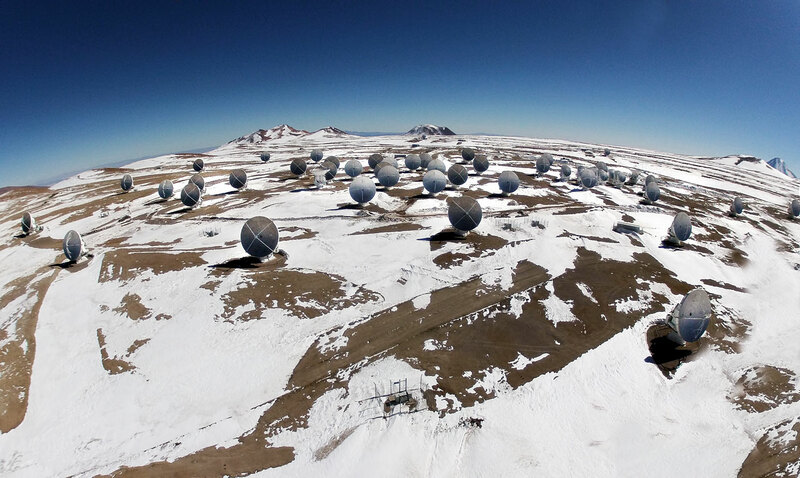 “In this observation, we used only 16 antennas, which are about one-fourth of the complete number of ALMA antennas, but it was really surprising that we could get so many molecular distribution maps in less than two hours. We have never obtained such a quantity of maps in one observation,” said Takano, the leader of the research team. The results clearly show that the molecular distribution varies according to the type of molecule. While carbon monoxide (CO) is distributed mainly in the starburst ring, five types of molecules, including complex organic molecules such as cyanoacetylene (HC3N) and acetonitrile (CH3CN), are concentrated primarily in the CND. 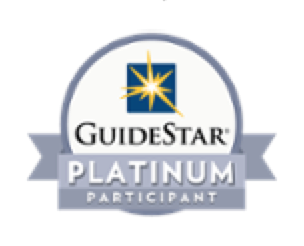 In addition, carbon monosulfide (CS) and methanol (CH3OH) are distributed both in the starburst ring and the CND. As the supermassive black hole devours the surrounding material, this disk is heated to such extreme temperatures that it emits intense X-rays and UV photons. When complex organic molecules are exposed to these photons, their atomic bonds are broken and the molecules are destroyed. Astronomers assumed that such regions would therefore be devoid of such complex organics. The ALMA observations, however, proved the contrary: Complex organic molecules are abundant in the CND, though not so in the broader starburst region. “It was quite unexpected that complex molecules with a large number of atoms like acetonitrile and cyanoacetylene are concentrated around the black hole’s disk,” said Nakajima. The research team speculates that organic molecules remain intact in the CND due to the large amount of gas there, which acts as a barrier for the X-rays and UV photons, while organic molecules cannot survive the exposure to the strong UV photons in the starburst region where the gas density is comparatively lower. 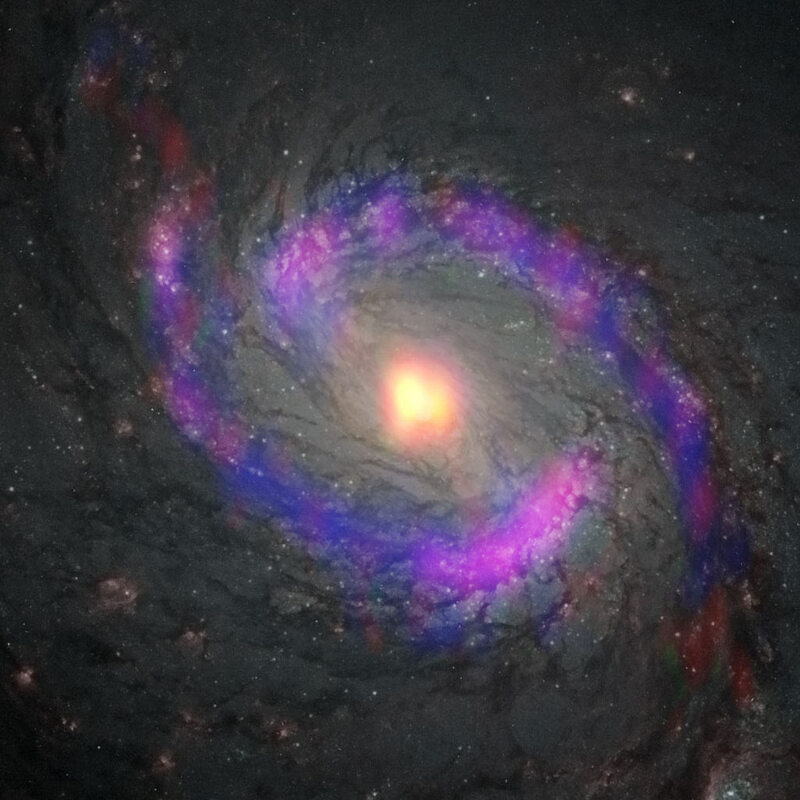 The researchers point out that these results are a significant first step in understanding the structure, temperature, and density of gas surrounding the active black hole in M77. “We expect that future observations with wider bandwidth and higher resolution will show us the whole picture of this region,” said Takano.